Since being treated for early stage skin cancer several years ago, I have become passionate about using the highest quality skin care products to pamper my skin and keep it healthy. Stemulation™ is a luxury skin care line that may help to rejuvenate the skin by using stem cell technology. This is the world’s first skin care line that harnesses this technology and I appreciate that all of the products are eco-friendly and there are absolutely no potentially harmful chemical additives! Stemulation™ has been developed to help women (and men) target problem areas and reduce surface wrinkles, eliminate sunspots, tighten the skin and help to smooth fine lines. It features a Facial Serum, Boost Crème, Micro Derm Scrub, Rescue Repair Hand & Body Treatment, Gentle Gel Cleanser, Elevate Eye Cream and Relance Body Lotion. 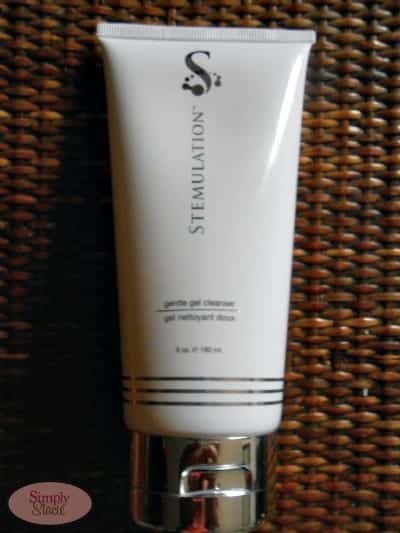 I have been using Stemulation™ Gentle Gel Cleanser ($35) in the morning and before going to bed in the evening and I really like this effective formula as a little bit of product goes a long way. I love the light, refreshing gel that removes every trace of make-up and leaves my normally dry, sensitive skin feeling clean. It never feels dry or tight and my freshly clean skin absorbs my moisturizer very quickly. It contains luxurious and soothing ingredients such as aloe, chamomile extract, grapefruit peel oil, orange peel oil and antioxidants. The lovely citrus scent is appealing and even my husband who normally refuses to use any skin care product he deems “girly” washes his face with Stemulation™ Gentle Gel Cleanser and said that it makes a great shaving gel too. You are invited to visit Stemulation™ to learn more about how stem cell technology can help your skin and purchase the right skin care products for your particular needs. I have not yet used any of the other products in this luxury skin care line however if it is as effective as the Gentle Gel Cleanser then I look forward to seeing how the other products would be able to help my sun damaged, aging skin. I would like to try the “Serum/Crème Set 30ml”. I love this! A portion of our proceeds is donated to the Footprints Foundation, which supports a wide variety of philanthropic charities. I’d like to try the Elevate Eye Cream. I learned that their products are formulated with cutting-edge stem cell technology to restore the skin cells that are vital for smooth youthful skin. I would like to try the Relance Body Lotion. I’d love to try this and the Elevate Eye Cream also. I would love to try the Elevate Eye Cream. My wife would like to try the boost cream. Rescue Repair Hand & Body Treatment. I would like to try the Stemulation Elevate Eye Cream. I would like to try the elevate eye cream. I would love to try the Facial Serum 15ml …there are so many great products! I would like to try the rescue repair hand and body treatment. Id love to try the micro derm scrub. I would love to try the Elevate Eye Cream!